I used double faced coloured paper of 8×4 cm/ 3.1×1.6″ and the same size of sketch paper. Or draft paper; I never know which name to call it: the strong yet thin paper slightly transparent and whitish that you sketch on at some part of your school life… The sketch paper doesn’t hold that well the curls but it doesn’t hold it that bad either… If I find a better substitute I’ll definitively use it. This kusudama is also nice before curling: it has a totally different feeling to it. 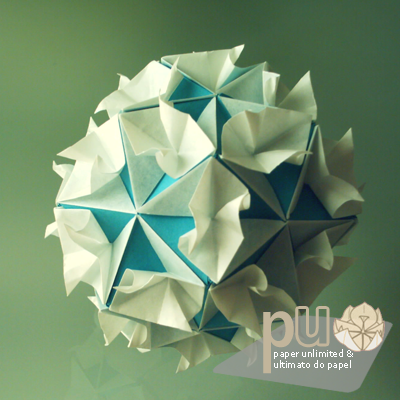 This entry was posted on 2008|02|09 at 09:38 and is filed under kusudama (glued), modular origami. You can follow any responses to this entry through the RSS 2.0 feed. You can leave a response, or trackback from your own site. Not that I’m impressed a lot, but this is a lot more than I expected for when I found a link on Delicious telling that the info here is quite decent. Thanks.